Right now the folks at DC must be looking like someone stole the hole from their doughnut. In a wave of extra '2010 news' they announced; new editions of The History Of The DC Universe, an all-new 15 part Who's Who, the launch of Legacies - a 10 part 'from Golden Age to Modern Age' story by industry icons like Lein Wein, and Joe and Andy Kubert - plus the first art of the Scarlet Speedster from the upcoming Flash ongoing series artist Francis Manapul. Then along comes toy giant Mattel who beats them for 'coolest DC News of the day' and robs DC of being the ones to debut their 2010, 75th Birthday logo! Articulation and detailed sculpting be hanged - I think they kick it big time, and price dependant I might even snag the odd one or two to sit on the bookshelf. 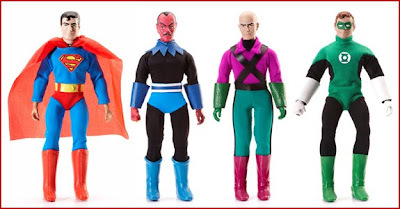 2010 will see three waves of four figures, with Wave 1 staring: Superman, Sinestro, Lex Luthor, Green Lantern (Hal Jordan), and kicked off by Green Arrow, Tuesday, December 15th, exclusively at MattyCollector.com. I'm interested in the new Who's Who series...wonder what it'll look like? These new Megos are cool, too. If they make an Aquaman I'll be there! Thanks for the post Rob! Yeah it's good to see DC getting out the trademark staples like 'Who's Who' for their anniversary year - it's about time! As for the Megos - I'm looking forward to seeing how Aquaman, Flash and maybe the Riddler fare. I might be outta luck on the last one - but no harm hoping! Hey, there was an original Mego Riddler...I don't think that's a reach at all.